School Library Journal School Library Journal | Picture Books in the Dorm Room? School Library Journal | Picture Books in the Dorm Room? Undergraduates from a variety of majors flock to our children’s literature course at Saint Michael's College with memories of formative picture books and riveting YA novels. They’re ready to revisit favorites and claim new ones. But we found that they seldom visited or used the books in our library's extensive children’s collection. Instead of hoping students would come to the books, we brought the books to them. 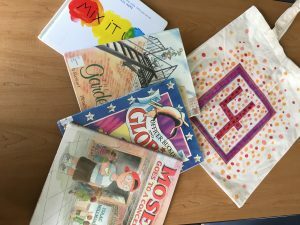 We created circulating book bags, each containing four picture books, which would rotate among the students on a weekly basis. Beyond getting books into their hands, we had several goals for the project: to shape what students were reading, to highlight components of the course, to ensure they were able to apply the course readings to books immediately, and to create a curiosity for the rest of the collection and help them see the value in utilizing the library's print collection. 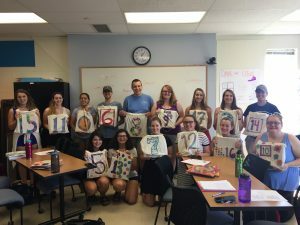 To make these mini-collections mobile and encourage our students to have fun in the process, we gave each student a canvas book bag and fabric markers on the first day of class, along with an assigned number. For inspiration, we showed a few slides of numerals by artists Opalka, Johns, and Soltis. For each grouping of four titles, we considered genre, diversity of illustration styles, and a mix of recent and classic titles. We referred to national and state award lists, suggestions from #weneeddiversebooks, and indulged in some personal favorites. A typical book bag might include a work of nonfiction, a book of poetry, a classic, and a current title. The most important factor was curating a collection of titles that we could use as reference points during class and that would spark deeper discussion and reflection. Each week, we asked students to relate that week’s topic to their current set of book bag titles. For example, when we studied research on developmental responses to books, students were asked to apply these findings and predict which ages might pick up certain books in their bags. During an illustration study, students identified how the illustrators in that week’s bag used line, shape, color, and composition. As we progressed through the semester, each new topic on the syllabus sharpened the lenses through which they read and evaluated the books. They were able to identify the “absent parent” theme, to consider cultural and gender issues, and to note the motifs presented by different genres. Not only did they explore the current bag’s treasures, but they soon felt ownership of their prior weeks’ titles and would refer to those in relevant ways, too. Their growing familiarity with the selected titles set them up well to choose other books to take along to a required read-aloud at our campus Early Learning Center. Student response has been positive. They arrive at class ready to try out new terms they have learned (“Check out how the story actually starts on the endpapers”), make connections with classmates who have expressed author or genre preferences (“Don’t miss this new one by Steve Jenkins”), and confide how their roommates looked forward to read alouds from the new book bag each week. One student reported that he often read his books via FaceTime to his younger sister and another said that she saved her book bag reading as a reward for finishing her calculus homework. Our own goals were met as well; students were able to develop and practice book talking skills at the beginning of each class session before swapping bags. The initiative has allowed us to structure a scaffolded introduction to criteria for good literature, notable authors and illustrators, and to get thoughtfully selected titles into the hands of our students. A culminating assignment asks this semester’s students to construct a quartet of books for future classes. Did we meet our initial goal of getting students into the library’s collection? While we can’t draw a direct connection, we were delighted to see that our children’s collection is now the most broadly circulated collection in our library. Valerie Bang-Jensen is professor of education at Saint Michael’s College, where she teaches literacy courses. Her most recent book, co-authored with professor of biology, Mark Lubkowitz, is Sharing Books, Talking Science: Exploring Scientific Concepts with Children’s Literature (Heinemann, 2017). Kristen Hindes is the associate director of reference & instruction at the Saint Michael's College Library, where she spends as much time as possible in the children’s literature section. Love this idea! Pre-service teachers need to examine their own reading habits, as it is surprisingly common that many are not voracious or aesthetic readers. I'm sure they started to see themselves as readers as they chose titles and shared them. The "quartet of books" is very much like my cluster assignment, and those evaluative skills you introduced will empower them to find the best resources for their classrooms. I'm sure they learned about collaboration with a librarian, as well. Nice job! Hi Meg! Good to hear from you--a voice from my past. I'll try to answer your questions here. There are about 20 book bags, numbered 1-20 (for 20 students). The quartet of books lives in the same book bag all semester. We swap book bags every Wednesday in class. It's kind of random---first they swap with the people at their table, and then they have to find classmates who haven't yet had their bag. There is a book mark that stays in each book bag, and the students write their name on the back so we can double check who has had each one. I give each of them a complete list of the books in each book bag (grouped by bag) so that they can refer back and remember ones they have read. If you find my email on the Saint Michael's College (education dept) website, I'll send you a list of the books!